We conducted the investigation at the site, and there seemed to be a problem with the UPS (Uninterruptible Power Supply). We are considering bypassing the UPS, and the work to restore the system will start tomorrow as soon as we are ready. The temperature of the pool as of 6PM [on June 30] was 36.6 degrees Celsius. We estimate that it will take about 60 hours for the water temperature of the Spent Fuel Pool to reach the upper limit of the safety regulations at 65 degrees Celsius. That gives TEPCO until 6AM on July 3 to fix the problem. TEPCO already said they didn't find any leak. TEPCO investigated the site, and said that the UPS (Uninterruptible Power Supply) may have broken. The UPS is connected to the main power supply and the cooling system, and provides electricity in an emergency. In order to cool the fuel stored in the Spent Fuel Pool, the cooling system draws water from the pool, cools the water and circulates it back into the pool. There are two lines, and TEPCO tried to resume the cooling operation by starting the backup line. 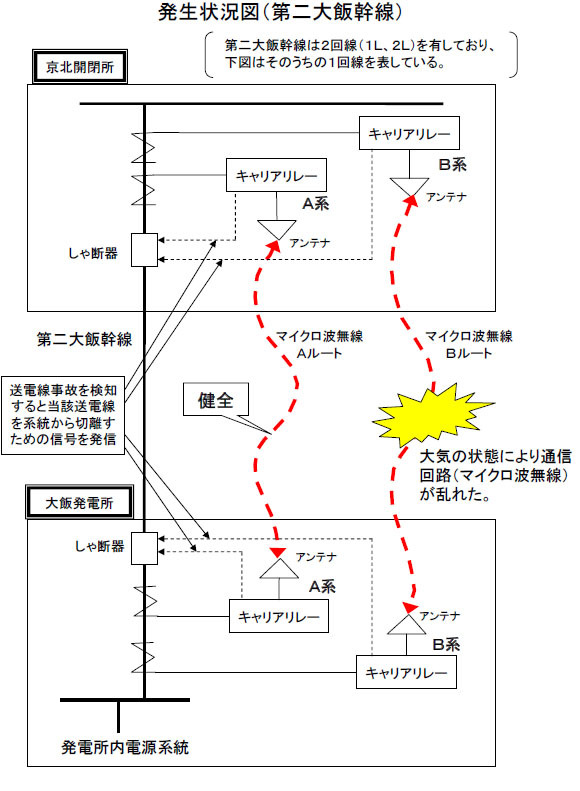 However, since both lines use the same UPS, TEPCO couldn't restart the system. TEPCO is planning to bypass the UPS and restart the system. There are rumors (like the one from Professor Takeda) that the Reactor 4 SFP is mechanically damaged because of shoddy construction. I have no idea what the basis is for Professor Takeda's assertion that shoddy construction work damaged the pipe of the cooling system. They seem as baseless as the rumors that everything is dandy or that the building is listing like the Tower of Pisa. Hello. I was surprised by DM [twitter's direct message] from one of my followers saying "Right now, the rumor of Reactor 4..." At least mechanical engineers like me haven't been called in. It looks like a problem with the control system. Repair will probably be tomorrow, as they need to arrange for the repair parts. For the time being, looking at the temperature trend, I don't think there is anything to worry. If it is really a serious situation, we would receive an emergency call. Then the crane will be used [Putzmeister concrete crane that pours water directly into the Spent Fuel Pool]. If that should happen, I will tweet right away. But I'm enjoying my day off, eating sweets. See ya. (UPDATE 2) Another rumor that the US's ABC and Germany's ZDF are in Ooi-cho. (UPDATE) Journalist Ryusaku Tanaka just tweeted that the employees at the nuclear plant, since the only road to the plant is blocked by the protesters and the police, arrived to work from the ocean, using a ferry boat. Tanaka says he heard it from a taxi driver who drove them to the ferry. Further, someone else tweeted that the riot police who suddenly showed up had climbed the mountain to get there, because the only road to the plant is still blocked. Both pieces of information are unconfirmed. It looks like Mr. Iwakami is on the way to the scene, bringing in supplies and rain jackets to his staff at the scene who have been netcasting the protest all night on IWJ's USTREAM Channel. Iwakami is at JR Fukui Station. Right now, it is 10 AM on July 1, 2012 in Japan. There's a rumor that more riot police on the way. Funny things have happened in the past 15 months, and this is the latest. I got an email from Youtube telling me one of the videos I uploaded on my Youtube channel last year is in copyright violation and Youtube is penalizing my account status. I went to look at which video and what entity is claiming the violation. After all, all the videos I post there is directly from TEPCO's Photos and Videos page, with the explicit word from TEPCO that the use of the videos and photos on the page does not need a written permission. The video in question is right from that page, as with any other videos that I have posted. It is the video from October last year, in which TEPCO employees investigated the upper floors of Reactor 1 building, braving the high radiation. Is TEPCO claiming the copyright violation? No it was TV Asahi Corporation. I've disputed the claim as preposterous on Asahi's part to claim TEPCO's video as their own. During the dispute, the video is still on my channel. The video is always available on TEPCO's site (in Japanese, and in English). It's quite puzzling, pointless, nothing short of harassment. I remember Yomiuri claimed the copyright of the aerial footage of the plant taken by the Self Defense Force last year, and the video was taken down. It also attests to the laziness of Youtube, who simply takes the word of any entity claiming "copyright". It's raining there. But a group of protesters against the restart of the plant has been facing the Fukui riot police in front of the entrance gate. Yasumi Iwakami's IWJ crew has been there from the beginning, netcasting on their USTREAM channel. Right now, the protesters are drumming and shouting "Saikado Hantai (no to restart)". The first Nuclear Emergency Preparedness Training since the Fukushima I Nuclear Power Plant accident was being planned last year. What did the national government assume in an nuclear accident, now that they had supposedly learned the "lessons" from the Fukushima accident? Why, eliminate the situations like "core melt" (meltdown), of course! We cannot alarm the public, can we? Assumption by the national government on [Nuclear Emergency Preparedness] training: "No core melt", as it would "increase uneasiness" after the nuclear accident. It was discovered on June 30 that the Japan Nuclear Energy Safety Organization (JNES) had drafted the plan for the National Nuclear Emergency Preparedness Training [last year] that would exclude the possibility of core meltdown as had happened in the Fukushima nuclear accident and avoid assumption of the worst-case scenario. JNES had been instructed to draft the plan [by the national government]. Kyodo News obtained the draft plan with the freedom of information request. [The reason for excluding "core melt"] was because it would increase uneasiness among the local residents. In the meantime, the plan assumed the Off-Site Centers, which didn't work in the Fukushima nuclear accident, would be functioning fully after a certain period of time. JNES supports the practical aspect of safety regulations by the Nuclear and Industrial Safety Agency under the Ministry of Economy, Trade and Industry. It drafted the plan for the Training for the fiscal 2011 under the instruction from NISA. More than not assuming the core melt, the fully-functioning Off-Site Centers triggered a belly laugh from me. Here's the list of all the Off-Site Centers, at NISA's site. By design, they are located within the 20-kilometer radius from the respective nuclear power plants or nuclear facilities. The Off-Site Center for Fukushima I Nuclear Power Plant was only 5 kilometers away from the plant, and didn't even have the maps of the areas outside the 10-kilometer radius from the plant. It didn't have air filters to block radioactive materials either. The Off-Site Center for Ooi Nuclear Power Plant (which has been having a series of seemingly minor problems indicative of deferred or sloppy maintenance) is 7 kilometers away from the plant, and the only way to access the plant is by one road. Japan is very ill-suited to operate a nuclear power plant, and it is not the matter of technology. Obamacare: Did Chief Justice Roberts Flip in the Last Minute? Two scholars, one a law professor at University of Boulder and the other an economic Professor at Barkeley, say Chief Justice Roberts may have changed his position at the last minute and sided with the liberal minority - i.e. dissent - and turned that side into the "majority opinion" in the 5 to 4 decision. They cite the wording of the eventual "dissent" from Justices Thomas, Scalia, Alito and Kennedy referring to Justice Ginsburg opinion as "dissent". Did Justice Roberts change his Obamacare vote at the last minute? Did Chief Justice John Roberts decide to join the court's liberal wing and uphold the individual mandate at the very last minute? That's the theory floated by Paul Campos, a law professor at the University of Boulder, and Brad DeLong, a Berkeley economics professor and former Treasury Department official under President Clinton. Campos wrote Thursday in Salon that the dissent had a triumphant tone, as if it were written as a majority opinion, and that the four conservative justices incorrectly refer to Justice Ruth Bader Ginsburg's concurring opinion as a "dissent." "No less than 15 times in the space of the next few pages, the dissent refers to Ruth Bader Ginsburg's concurring opinion as 'Justice Ginsburg's dissent,'" Campos wrote. DeLong pointed out on his popular blog that in Justice Clarence Thomas two-page note on the dissent, he refers to the conservatives' dissent as the "joint opinion" instead of the "joint dissent." Campos hypothesized that the conservative justices may have intentionally left these typos as a way of signaling to the outside world that Chief Justice Roberts abandoned them at the last moment. Lyle Denniston, the long-term courtwatcher who writes for SCOTUSblog, tells Yahoo News that he "can't account for the wording of the Thomas opinion." But Dennison disagrees with Campos that it's incorrect for the dissenters to refer to Ginsburg's opinion as a dissent. Ginsburg wrote that she thought the individual mandate should have been upheld under the Commerce Clause, and she was in the minority in that respect. Kennedy and the four conservative justices, including Roberts, said the mandate would be illegal under the Commerce Clause. Roberts upheld it as a tax, instead, with the four liberal justices partially concurring. "My own sense, from reading the Roberts opinion, is that it was written as a majority opinion in all of its drafts, and that various Justices joined or dropped off," Denniston told Yahoo News. "I think he was determined to try to uphold some key parts of the law, if he could find a way, partly because...he has grown concerned about the public perception that his Court is a partisan-driven Court." There are other scholars who think Justice Roberts may have flipped at the last moment. Here's more from Mother Jones (6/28/2012). India is to have 6 fast breeder reactors in the next 15 years, and India is not a signatory to the Treaty on the Non-Proliferation of Nuclear Weapons. India, Pakistan, and Israel are the three states who have not signed the treaty. The article below also says at another nuclear power plant in India in 2009, workers fell ill after drinking tritium-laced water from a water cooler. Two workers at the Rawatbhata Atomic Power Station in Rajasthan have suffered exposure to high doses of radioactive tritium and are under observation. The incident took place on June 23 at Unit 5 of the plant during routine maintenance work. "There was no abnormal release of radioactivity to the environment," Nalinish Nagaich, Executive Director, Nuclear Power Corporation of India Limited said from Mumbai. He said there was localised increase in tritium concentration in the building of Reactor-5 due to the opening of the moderator cover gas line where the welding jobs were to be performed. "All persons involved in the maintenance work were monitored and two were found to have four to five times higher uptake of tritium," Nagaich said. The exposure of other persons is below the annual exposure limit specified, he said. The incident was reported to the Atomic Energy Regulatory Board (AERB) and was investigated by independent committees set up by the regulator and NPCIL. Tritium is a mildly radioactive type of hydrogen that is formed in the operation of nuclear power plants. The workers had inhaled it while carrying out maintenance activities in the reactor building and it will come out of the body on its own through urine. The level of tritium in the body is expected to reduce appreciably within a week. The NPCIL, in a report on its website, said that the incident occurred when a modification work for assuring a provision of alternate water addition to the moderator system in the Reactor-5 was being carried out. "The uptake occurred due to inadvertent rise in tritium levels in a localized area of the containment building of the Reactor-5," it said. In 2009, a large number of workers at Kaiga atomic plant had taken ill after consuming tritium-laced water from a water-cooler. 17,000 is what the police announced, 200,000 is what TBS TV News said, supposedly quoting the organizers. The photo below is taken from the helicopter (hired by the citizens' groups and IWJ) by the professional photographer Maki Ishii. It is the scene at one street corner. Protesters, many of whom had already learned from Twitter and other social media that there would be helicopters flown by the independent journalists and citizens groups, brought pen-lights and flash lights to wave at the helicopters. Someone tweeted on this photograph, "At most 3,000. What's the big deal?" NHK: "More than the last time"
"Yes it is a big sound." As far as the police is concerned, it was a 17,000-strong protest overall. I just wanted to post this screenshot of all his 9 channels. Channel 2 has TEPCO's Matsumoto in the regular press conference currently on-going. June 29 Anti-Ooi Protest in Tokyo Will Be Covered by IWJ's All 9 Channels: "Project to Visualize Citizens' Voices"
(UPDATE) Tweet by Japan Communist Party's newspaper "Akahata" (Red Flag) says "30 minutes before the official start of the protest, but the sidewalks are already full of people. There are significantly more people than last week." Iwakami's USTREAM channel 5 is already showing protesters. Journalist Takashi Hirose and his supporters will fly a helicopter to cover the event from the air, and journalist Yasumi Iwakami and his staff will fly something "on a small budget" as Iwakami tweets. And Iwakami's IWJ's all 9 USTREAM channels will cover the protest at the Prime Minister's Official Residence in Tokyo from different locations and angles. Now that's true journalism in my book. Iwakami calls it "Project to visualize citizens' voices". Channel 2: At 6PM, regular schedule (TEPCO press conference), then the delayed net cast of the aerial video taken by Hirose's group (for security reasons, they weren't allowed to netcast live; same with Iwakami's group). Our Planet TV will also netcast this video. Channel 8 and Channel 9: IWJ's volunteer cameramen and camerawomen from various locations at the protest. I do not agree with his stance on certain issues, but he definitely have my deep respect. Some say this protest will be much bigger than even the June 22 protest. Certainly the police seems to think so, as it is dedicating "several hundred" policemen to guard against unexpected incidents, according to Mainichi Shinbun (6/29/2012). According to Mainichi, that is the largest number of policemen at a protest in more than a decade. The police admits that this is a type of protests and demonstrations that it is not familiar with at all. Traditionally, protests and demonstrations in Japan have been organized by existing groups and political parties. It has been easy for the police to estimate the number of participants and plan accordingly. But these days, organizers of protests and demonstrations are apolitical, and people learn about the protests via Twitter and Facebook. The police just can't come up with a good estimate, says Mainichi. (UPDATE) "... after Problem" Alarms sounded off in the central control room for the Reactor 3's pump in the afternoon of June 29, according to Jiji Tsushin (6/29/2012). The pump circulates the primary coolant that goes into the Reactor 3 Pressure Vessel. Today's protest in front of the PM's Official Residence is shaping up to be big, people are tweeting. I have a feeling that KEPCO may be worse than TEPCO when it comes to cost cutting and deferred maintenance. After all, Kansai merchants are historically known for shrewd, economizing ways to make more profit. In a matter of few days, Ooi Nuclear Power Plant has managed to have three separate minor problems, and two of them triggered alarms. First it was poor maintenance, then it was a human error, then probably another case of poor maintenance. KEPCO announced on June 28 that a temporary short circuit at the switching station for Reactor 3 at Ooi Nuclear Power Plant (in Ooi-cho) was caused by the rainwater leaking into the equipment that control the power supply system at the station. According to KEPCO, after checking the 108 parts that control the system, the company found one of the parts filled with water. KEPCO thinks the rubber seal had deteriorated, allowing the rainwater to leak in. The company says it will take countermeasures such as replacing the rubber seal. Then, an alarm went off in the central control room at the power panel for Reactor 3, as KEPCO reported on June 28. Reactor 3 at Ooi Nuclear Power Plant is currently prepared for the restart. At 3:58PM on June 28, 2012, an alarm "Attention C DC power panel failure" sounded off at the panel for Reactor 3 in the central control room. The alarm was reset at 4:05PM. The alarm was set off when our operator accidentally turned off the power switch when he tried to turn on the monitor screen. There is no failure of the equipment. This incident is within the safety regulations and it is not a trouble as defined by laws and regulations. It has nothing to do with the work currently undertaken for the restart of the reactor, and there will be no effect on the work. Also, there is no radiation leak in the environment. That's what the government regulations do. As long as it is within the government-mandated laws and regulations, it is not a problem as far as the laws and regulations are concerned. No one will be at fault. "Pro forma" was mentioned by the reader Atomfritz on another post about Ooi Nuke Plant mishap. Right on the money. But wait, there's more. Another alarm was set off on June 29, this time at Reactor 4. Nuclear and Industrial Safety Agency under the Ministry of Economy, Trade and Industry announced on June 29 that an alarm was set off at the pump at the steam condenser. The pump is used to sample coolant to make sure no seawater is mixed in. NISA and KEPCO will disassemble the pump and investigate. According to NISA, the alarm was sounded before 10AM on June 29. The alarm is set off when there is a large excess pressure in the pump. There is a possibility that the sampled water didn't flow smoothly or was blocked. It's Friday in Japan, and that means Ooi restart protests are on again in Tokyo and Osaka. The same time, the same places in Tokyo (at PM's Official Residence) and Osaka (KEPCO's headquarters). This Friday, someone (I think it is Yasumi Iwakami's outfit) is flying a helicopter to capture the scene from the air. Not just for dramatic effect but also for refuting people who have tried their best to snicker at the number claimed by organizers (total 45,000) and downplay the significance of the protests. They will analyze the visual images from the helicopter and estimate the crowd size, I hear. For those of you who go, be safe. "Agents provocateurs" may be there, claiming to be anti-protest and pro-nuke right wing, talking trash, like this one last week. US Supreme Court Upholds Obamacare Indivisual Mandate as "Tax"
Nancy Pelosi gushed they "made history" when the Congress passed the Affordable Care Act, aka "Obamacare". Sure. As if it was a good history. Today, SCOTUS (Supreme Court of the United States) ruled 5 to 4 with Chief Justice Roberts siding with the liberal judges in stating that "Obamacare"'s mandate that forces individuals to buy health insurance or face penalty is constitutional, but as a "tax". So the pathetic performance by Obama's Solicitor General in front of the Supreme Court didn't make a difference. Too bad. Mr. Obama and his administration, and his party have been saying it is not a tax, but SCOTUS says it is. Obama's word on the SCOTUS decision? "Let's move forward..." Not a word about "tax". The US stock market tanked on the news of the decision. Right now, tech-heavy Nasdaq is down 1.9%, Dow down 1.2%, S&P down 1.2%. The stock market, or what's left of it after incessant intervention and manipulation from the central bank, sees it correctly, for today, that it is a tax burden - the last thing that the economy needs right now. Washington Post is a handy calculator to assess the impact on your household budget. Using the calculator, if you have no insurance, 2 people in the household, annual adjusted gross income of $20,000 (barely above the federal poverty level), and you are married, you may be able to buy insurance in the federally assisted state insurance exchange for $800, or 4% of your gross income. If you do not buy the insurance, you will get penalized and required to pay the maximum fine of $1,390. If your adjusted gross income is $40,000 (national average), then the cost of insurance at the insurance exchange will jump to $3,800, or 9.5% of your adjusted gross income. If you don't buy the insurance, you will be penalized with the same $1,390 fine. If your adjusted gross income is $60,000, the cost of insurance at the insurance exchange will be $5,700, or 9.5% of your adjusted gross income. Penalty will be the same as in the previous two cases, at $1,390. SCOTUS has decided it's all within the right of the Congress to tax citizens, as long as this Individual Mandate is a "tax". GOP House Majority Leader Eric Cantor says a vote to repeal the law will be on July 11. Conservative media thinks the 2012 election has just become the 2010 election, a referendum on Obamacare. US Ambassador to Japan in #Fukushima: "Presence of US Citizens in Fukushima Will Appeal to the World That Fukushima Is Safe"
Mr. John Roos, US Ambassador to Japan, is visiting Fukushima with officials from 30 US companies in decontamination business, promising full cooperation in Fukushima's effort to have the residents come back to their homes in the areas contaminated with radioactive materials from the Fukushima I Nuclear Power Plant accident. He also put in a word that the presence of the US citizens, working on the decontamination projects in Fukushima, will be beneficial as it will appeal to the world that Fukushima is now safe. It was Mr. Roos who recommended the US citizens in Japan to leave the 50-mile (or 80-kilometer) radius from the plant, right after the accident started on March 11, 2011. But now, the US businessmen can be "safely" in Fukushima. After all, US college kids and high school kids have already been in Fukushima, doing cultural exchange and volunteer cleanup work. US Ambassador to Japan Roos met with Fukushima Governor Yuhei Sato on June 27 at the Fukushima prefectural government office, and told him that the US will cooperate in all aspects of decontamination work utilizing the US technologies. Officials from 30 US companies in decontamination businesses accompanied Ambassador Roos. Ambassador Roos said, "The US possesses the cutting-edge technologies in decontamination, and can be a good partner to solve problems that Fukushima faces. All these people here [probably referring to the businessmen who accompanied him] are also thinking of what they can do to help Fukushima." He further said, "By having the US citizens in Fukushima, we can appeal to the entire world that [Fukushima] is safe." Governor Sato thanked the ambassador for the help from the US after the March 11, 2011 earthquake/tsunami, and said "Decontamination is a huge task as we proceed on having the residents return home. I hope the visit to Fukushima this time will [further?] enhance your [decontamination] technologies." The group was briefed on the progress of decontamination work in the prefecture by the officials from the prefectural government and the Fukushima City government in Sugitsuma Kaikan [conference center and lodge run by the Fukushima prefectural government] in Fukushima City. Afterwards, they visited the decontamination sites in Nankodai and Onami Districts in Fukushima City and in Date City. Ambassador Roos visited Fukushima in January this year, and spent more than one hour talking to residents from Okuma-machi in their temporary housing in Iwaki City. That's much more than most Japanese government politicians have done. TEPCO, soon to be "effectively" nationalized, sent own workers to the Reactor 1 building at Fukushima I Nuclear Power Plant on June 26 to measure the water level, radiation levels and temperatures inside the Torus Room. The workers used the CCD camera fitted with thermometer and dosimeter, and fed the cable through the gap in the floor from the 1st floor of the reactor building. Right near the surface of the water, it was 10,300 millisieverts/hour, or 10.3 sieverts/hour. TEPCO reports that the dosimeter failed in the water, at it exhibited the values of "10^8 - 10^9" (100,000,000 to 1,000,000,000) millisieverts/hour. If you recall, this was the reactor building where the steam measuring 4 sieverts/hour was gushing through the gap between the pipe and the floor on the first floor. Transparency of the water confirmed at least to 60 centimeters. Floating sediment on the bottom. And no, they didn't do the water sampling. There is no information on the document about the radiation exposure of the workers. They were in the vicinity of extremely high radiation for at least 40 minutes (length of the video). I hope several groups of workers took rapid turns. Japan to Raise Sales Tax from 5% to 8% (then to 10%) in an Effort to "Boost Economy"
That is what the politicians in the Noda Administration have been saying. Does that make sense? I don't think so. But nothing Japan has done, particularly after March 11, 2011, makes much sense. It was not just DPJ (Democratic Party of Japan, ruling party) but LDP (Liberal Democratic Party which is nothing liberal or democratic) and Komei Party voted in favor of raising the sales tax from the current 5% to 8%. About 50 DPJ politicians, many of whom are aligned with Mr. Ichiro Ozawa, voted no. The ostensible reason given to the Japanese for the tax hike is to pay for increasing costs for welfare and medical benefits for the elderly as the government reform the welfare system and the tax system. But there are only vague words of "reform", and the benefit for the elderly will be further decreased. There is no corresponding decrease in personal income tax, and there is no exception (such as on food items). In fact, personal income tax will be RAISED for the next 25 years to pay for the great "recovery" from the earthquake and tsunami. Big corporations, particularly large exporters, are very pleased with the sales tax being raised. It won't hurt them, as they will continue to get tax refunds for the overseas sales if the products are made in Japan. Japan’s Prime Minister Yoshihiko Noda risks stalling the economy by pushing through a higher sales-tax that may damp consumption even as it aids efforts to tame the world’s largest debt burden. The nation’s recovery after last year’s earthquake and tsunami could grind to a halt in 2014 when the first increase will take effect, according to UBS AG and Itochu Corp.
Parliament’s lower house yesterday approved the bill to raise the tax to 8 percent and then 10 percent in 2015 from 5 percent now. A slump would be a repeat of 1997, when an increase in the same levy contributed to pushing the economy into a 20- month recession, costing then Prime Minister Ryutaro Hashimoto his job. “If there are no economic stimulus measures along with a consumption tax hike we can see around zero percent growth in fiscal 2014,” said Takuji Aida, a Tokyo-based economist at UBS, who raised his growth forecast for the year ending March 2014 to 2.9 percent from 2.2 percent because he sees a 4 trillion yen ($50.4 billion) rise in consumption and investment ahead of the tax increase. A 1 percentage point increase in the tax would cut growth in real gross domestic product by 0.32 percentage point in the year after implementation, according to the Cabinet Office’s Economic and Social Research Institute. Even with the sales tax increase, the government said in January that it will probably miss its goal of achieving a primary balance surplus, which excludes debt servicing costs, by fiscal 2020. It forecast a primary deficit of between 1.9 percent and 3.1 percent of GDP in that year, compared with the fiscal 2011 deficit of 7.4 percent. Gross public debt will be 223 percent of GDP next year, up from the projected 214 percent in 2012, “pushing Japan’s public finances further into uncharted territory,” the Paris-based Organization for Economic Co-operation and Development said in a report last month. Japan’s benchmark 10-year yield was 0.805 percent at 12:50 p.m today. It reached 0.79 percent on June 4, the lowest since June 2003 and the least globally after Switzerland’s. Five-year credit-default swaps for Japan’s bonds were 94 basis points yesterday, having slid 12 basis points since Noda took office in September, data compiled by Bloomberg showed. The yen was trading at 79.44 to the dollar at 12:45 p.m in Tokyo, having strengthened more than 5 percent since mid-March. The Nikkei 225 Stock Average was at 8,707.64, down about 14 percent over the same period. Mr. Watanabe has apparently never heard of the "Laffer curve". Sales tax of 15% is what Christine Madeleine Odette Lagarde, IMF chief who pays no income tax on her IMF salary, recommends for Japan. Prime Minister Noda probably couldn't care less about the angry public protesting outside the Prime Minister's Official Residence against the restart of Ooi Nuclear Power Plant. He got this tax increase bill passed, with the overwhelming support from the major parties. Ooi Nuke Plant may have served as an excellent diversion. We are supposed to take their word for it that it's not active and that the plant is is safe. Fukui Shinbun reports that KEPCO, Ooi Plant operator, cannot find photographs of the crushed zone that runs through the plant compound, between Reactor 2 and Reactor 3 buildings. Two university researchers have said publicly that the crushed zone could be active faults or that it could be activated by the active faults nearby. It has been pointed out by researchers that the crushed zone at the Ooi Nuclear Power Plant may cause the slippage of the ground surface when the active faults move. The plant is currently being prepared for the restart in Ooi-cho in Fukui Prefecture. The Nuclear and Industrial Safety Agency disclosed on June 25 that the photographs of the crushed zone that the agency had asked KEPCO to submit weren't submitted. According to NISA, the request was not legally binding. KEPCO says "We're looking for the photographs but we can't find them." NISA says the request for the photographs is part of the information gathering, and the agency hasn't changed its opinion that the crushed zone at Ooi Nuke Plant is not active. NISA disclosed this information during the meeting with citizens' groups held at the Office Building for the members of the House of Councilors (Upper House). NISA started collecting information after Professor Mitsuhisa Watanabe of Toyo University (tectonic geomorphology) had pointed out the danger of the crushed zone shifting, earlier this month. The agency requested the original survey map that was attached to the application submitted by KEPCO to the national government in 1985 to build Reactors 3 and 4 at Ooi Nuclear Power Plant, and the photographs of the crushed zone. NISA said KEPCO only submitted the original survey map. NISA also said it had unofficially asked the agency's 6 expert commissioners who were knowledgeable about active faults, and some of them were of the opinion that a field survey should be carried out. I have a feeling that KEPCO is looking all over the place for the photographs, in all locations where they know for sure they don't keep. The Ooi plant is set to restart on July 1. Why now, after 15 months from the start of the accident? Because the Tokyo Metropolitan government under Governor Shintaro Ishihara is finally forced to do so because 9 spots in Mizumoto Park in Katsushika-ku (one of the eastern Special Wards with higher levels of radiation than the rest of Tokyo) exceeded even their very lax (and near-impossible to be applied) standard of decontamination. What's that lax standard? They will decontaminate only if the air radiation level at 1 meter off the ground at a particular spot exceeds the air radiation levels of the surrounding area by more than 1 microsievert/hour. Japan Communist Party of the Tokyo Metropolitan Assembly announced the result of their measurement in the park on June 11, and one location allegedly measured 1.10 microsievert/hour. Japan Communist Party notified the Ministry of Education and Science, and the Ministry asked that we investigate, including the radiation levels in the surrounding area. So we did, using Hitachi-Aloka Medical's scintillation survey meter TCS-172B. We sent out someone from the Environment Bureau in the evening. The result was 0.99 microsievert/hour at 1 meter off the ground, and the surrounding areas measured 0.18 microsievert/hour. So, it is below the standard for decontamination set by the Ministry of Education and Science, which specifies the air radiation to be more than 1 microsievert/hour higher than that of the surrounding area. So our conclusion is that there is no need for decontamination. Never mind that Goshi Hosono's Ministry of the Environment sets the decontamination standard at 0.23 microsievert/hour air radiation. Tokyo is sticking by the Ministry of Education. By insisting on the Ministry of Education's standard, Shintaro Ishihara's government may have been hoping to avoid doing any "decontamination" in their city, which is by the way one of the finalists in the selection of the host city for 2020 Olympics. But on June 25, the Metropolitan government had to measure the park again after citizens armed with survey meters alerted them again, according to ANN (TV Asahi) News. Now, they are grudgingly admitting that for some unknown reason the radiation levels at 9 spots in the park are higher by more than 1 microsievert/hour than the surrounding areas, with the highest at 1.22 microsievert/hour. Tokyo Metropolitan TV (Tokyo MX) has a more detailed report, though. According to Tokyo MX, the locations were exactly what the Japan Communist Party of Tokyo Metropolitan Assembly had reported on June 11, but on June 25 the measurement was done by the Construction Bureau of the Tokyo Metropolitan government. Never mind the 28 alarms. Kansai Electric Power Company (KEPCO) has disclosed that the company now expects to start the nuclear reactor on July 1 at Ooi Nuclear Power Plant Reactor 3 (Ooi-cho, Fukui Prefecture), which KEPCO has been working on to prepare for the restart. So far, KEPCO has hinted that the start date for the reactor would be sometime between July 1 and 3. The clean-up of the pipes for the secondary cooling system is expected to be finished on June 26, which has made the schedule for the restart much firmer. According to KEPCO, the control rods will be removed on July 1. By the way, someone tweeted on June 23 that he called Yomiuri Shinbun and asked why the newspaper hadn't reported on the protest on June 22 in front of the Prime Minister's Official Residence in central Tokyo. The alleged answer from the newspaper was, "These people were doing what is against our principles and positions, so we made the decision not to report the protest. They were doing what we couldn't possibly approve of." If this is true, Yomiuri Shinbun has no pretense about what they are, and that is good. People can now jettison the idea that Yomiuri is in a business of reporting news. So the paper likes the so-called reform which will destroy what's left of the middle class and punish the poor and the elderly. It also likes the tattooed educators in Osaka City. The Nuclear and Industrial Safety Agency, still the one and only regulatory agency for the nuclear power plants in Japan, disclosed it during the press conference in Ooi-cho on June 24. Plant operator KEPCO says that happens all the time, nothing to worry about. And the famous last word, "It won't have any effect", on the restart. According to KEPCO, alarms also went off 32 times at 5 power transmission facilities located in southern Fukui and northern Kyoto Prefectures between KEPCO Takahama Nuclear Power Plant and the power transmission facilities, due to the unstable atmosphere. In all, 58 alarms sounded between 6:41PM on June 23 and 8:12AM on June 24. There was no actual problem at the power transmission facilities themselves, and [KEPCO and NISA says] the alarms were due to the wireless signals for monitoring were cut off by the atmospheric disturbances. KEPCO explained it was "a phenomenon that happens often, due to the weather conditions", and said there would be no effect on the work to prepare for the restart of the plant. It may be that such an incident is very common and very minor, and is usually not reported at all. But now that NISA and the electric power companies in Japan have lost credibility, whenever they do report an incident it is immediately upgraded to something that could be a major problem in the minds of the general public. When KEPCO says there will be no effect, people simply hear the echo of then-Chief Cabinet Secretary Yukio Edano in March 2011. These alarms are connected to the carrier relays, and use microwave for communication. Because of the bad weather in June 23 and 24, the atmospheric disturbances caused the phenomenon called "fading", according to Kaden Watch News. Hello everyone, I was there and it was fun ! People on the streets looked absolutely stunned, like it was the first demonstration of their life (and possibly so!). But many smiled or waved back to us, though I also saw some of them obviously not satisfied with the demonstration (I'm thinking about one particular elderly lady who shaked her head saying "No!" to us). The music was great, the slogans too. There was a young man, mike in hands, who used the shops'names or buildings'names to shout slogans, and it was irresistibly funny, like (near a hairdresser's) : "Let's save the hairdresser from radiations! Let's save him from Noda!" or: (near a sake and tobacco shop) : "Let's save tobacco ! let's save it from radioactivity ! Let's save it from Noda! Let's protect sake! Let's protect it from radiations!" The Suginami-ku group is just so full of energy and so creative (always), it's very exciting to be around them ! Good deed and good time altogether. By the way, to answer the question: yes, we rode the SOBU sen in big numbers, especially in the front car of the train. When I was at Shinjuku station, waiting for the 13:04 train, I spotted a few people wearing yellow (like myself) and talked to a gentleman who was obviously also going to NishiFunabashi (in a yellow Tee Shirt, with a yellow ribbon around his hat). We rode the train together and talked all the way about nuclear plants in Japan and in France and about how to convince people to take part into demonstrations in bigger numbers. Everyone was very, very friendly and I spotted people I met before in demonstrations elsewhere. To round up the good time, as I posted as an update yesterday, local pubs in Funabashi decided to offer discounts to demonstrators for a drink after the 2-hour walk. Smart. Good "imprinting" too - out-of-town people who come for anti-nuke demonstration are good for local businesses. Participants holding up the portraits of Prime Minister Noda and protesting against the restart of nuclear power plants, walking in the prime minister's constituency. They do look like they are having a good time.